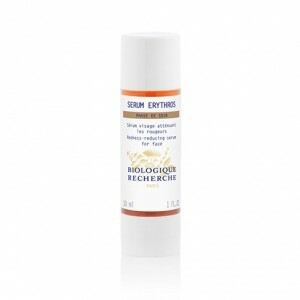 Sérum Erythros helps ease the symptoms of mild to moderate erythema of rosacea. This targeted serum acts simultaneously on the causes of vascular dilation, the formation and propagation of new blood capillaries, inflammation, and visible redness. The selected agents, plant-based or biotechnological, have all been objectively identified for their action on Skin Instants® that are prone to rosacea and are extremely sensitive. This serum will soothe and calm your bad-tempered complexion, whilst unifying and balancing it. Find out more about rosacea. Rosacea tendency and sensitive Skin Instants®. Agents inhibiting the formation of new vessels: Plant acid extract. Soothing agents: White tea leaf extract (Camellia Sinensis), Niacin, Kudzu extract. Agents reducing blood flow to the skin in vitro: Black crowberry plant juice from Lapland, red algae extract Porphyridium cruentum, Arnica flower-based complex, Solomon’s seal and cypress cones.